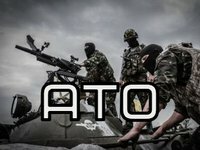 Ukrainian army positions in Donbas came under 28 attacks of Donbas militants in the past 24 hours, the anti-terrorist operation (ATO) press center wrote on Facebook on Wednesday morning. "Twenty-eight shelling incidents were observed over the past day, including 13 in each of the Donetsk and Mariupol sectors and two in the Luhansk sector," the report said. In the Donetsk sector, Ukrainian army fortifications near Avdiyivka and the Putylivska (Butovka) mine came under fire of large-caliber machineguns, grenade launchers and 82mm mortars, and 152mm heavy artillery began to bombard positions near Avdiyivka at around 10 p.m., the report said. Ukrainian army positions near Verkhniotoretske and Luhanske were attacked by use of automatic grenade launchers, and various types of mortars shelled positions near Troyitske. Ukrainian fortifications near Mayorsk and Mykolaivka Druha came under fire of 122mm self-propelled artillery. In the Mariupol sector, Ukrainian army positions were attacked by use of small arms near Krasnohorivka, Maryinka and Hnutove, and various types of grenade launchers near Novotroyitske, Vodiane, Talakivka and Taramchuk. Snipers were active near Krasnohorivka and Maryinka. Large-caliber machineguns, infantry combat vehicles and grenade launchers of the militants shelled Ukrainian army positions near Novozvanivka in the Luhansk sector. Three drones were seen flying along the contact line in the past 24 hours, the report said.